With Valentine’s Day just around the corner, it seems everywhere I turn there are tear-jerking stories being shown on TV. Tonight, we came across one of those stories on an episode of American Idol where one of the contestants is helping her boyfriend recover from a stroke. Less than a year ago, Jessica Phillips’ boyfriend suffered a stroke and it drastically changed their relationship. Jessica became more of a “caretaker” who helps her boyfriend with speech therapy everyday. Most people watching the story will be touched by Jessica’s love and determination, but I’m not most people. Don’t get me wrong, I was touched by the story but it also scared me. Tammy’s got a day’s worth of Jell-O ready for me. Me: I know, but it’s funny. Tammy: I mean, I don’t know that it’s not true but it’s prolly not true. Then we saw a preview for an upcoming movie called The Vow, the true story of a newlywed couple recovering from an accident that puts the wife in a coma and the husband has to win her heart again. Tammy: I would NOT!! I love Savannah. So in the unlikely event that I have a stroke, please feel free to visit me in the basement. I’ll share my Jell-O if you’ll help me learn how to read. Gallery | This entry was posted in Daily Life and tagged american idol, daily life, humor, Jell-O, Tammy, wife. Bookmark the permalink. Just Jello??? 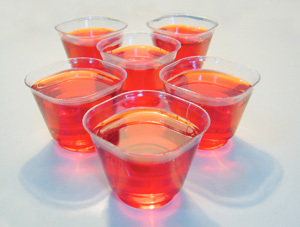 or Jello Shots??? For sure would make a difference in teaching you to read or talk! At least Savannah doesn’t have anything to worry about. She has been and will continue to be very well taken care of. I bet Savannah could teach you to read again. It’s possible, but it would take me years. I say that because she’s only awake for about 3-4 hours a day, if even, so they would have to be some pretty intense sessions.